Last month Bob traveled to Galicia as the headlining poet for the city of Vigo’s annual Kerouac Festival. Holman was one of four New York poets—his assistant E.R. Pulgar, Bronx-born Nuyorican legend Bonafide Rojas, and lead singer of The Mona Passage El Yabey—to cross the Atlantic for the festival held in the small Spanish port city at the same latitude as the Big Apple but separated by a watery expanse. Reading poems from several collections, including Picasso in Barcelona and The Death of Poetry, Holman was warmly received by the public, even performing some of his works in Spanish as translated by Pulgar and Sol Gaitan and collaborating with several of the other poets on the bill, including an impromptu performance of long poem The Impossible Rap as a duet with Marcos de la Fuente, one of the festival’s founders alongside Vanesa Álvarez. Performing all over the city from hallowed venues like Fundacioón Barrie to shouting poetry out of the Poem Mobile while driving around the city and performing Picasso in Barcelona on a ferry at sunset, Holman hopes to return to the New York sister city in Spain someday. Not even the Atlantic can separate a group of poets adamant and thirsty to inject a city with verse. Premio Ostana is a four-day Festival held in Ostana, Italy, in the foothills of the Alps, that celebrates Endangered Languages and the diversity of world's Mother Tongues. Sponsored by Chambra D'Oc, the Italian outpost of the Occitan language, I am honored to be awarded this year's special prize for my work with languages -- the PBS show Language Matters with Bob Holman, produced and directed by David Grubin, will be screened with Italian subtitles, and Khonsay: Poem of Many Tongues , the 15-minute video poem in 50 languages I made with Steve Zeitlin will be on a continuous loop during the Festival, again with Italian translation available. 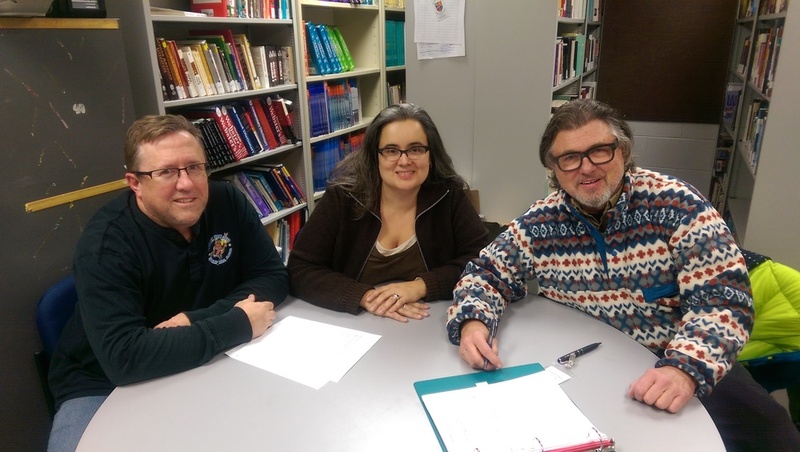 And of course it's the Endangered Language Alliance here in New York that gives me the framework to continue my work with languages. I'm a firm believer that language diversity and the revitalization of the world's smaller tongues is key to humanity's survival -- there are laws to help protect the physical planet, but there is also an ecology of consciousness, with a much smaller awareness that within these languages are not only the Ultimate Other, but also an encyclopedia of knowledge about these languages' piece of earth that can help to heal the planet -- and each other. The Cutouts (Matisse) is Bob Holman’s third chapbook with PeKa Boo Press, located in Woods Hole, MA. The series is edited by poet Eric Edwards and features cover and frontispiece art by Rebecca Edwards. The 50 miniatures in the book are ekphrastics — art inspired by other art — in this case the eponymous work with scissors and colored paper that occupied Matisse for the last 14 years of his life. Bound by a wheelchair due to polio, he created bold, striking, imagistic, brilliantly-colored shapes that were first collected in a project called Jazz. “You see as I am obliged to remain often in bed because of the state of my health, I have made a little garden all around me where I can walk…. There are leaves, fruits, a bird,” he wrote. Matisse generally cut the shapes out freehand, using a small pair of scissors and saving both the cut-out sheets and remaining scraps of paper. Holman’s poems take Matisse’s freestyle handling of paper and sets it free to dance and form poems of tenderness and whimsicality—reminiscent of nursery rhymes, love songs, and fragments of jazz, orchestral, rock, and folk stylings. What happened next was that composer Keith Patchel, former guitarist with Richard Lloyd (Television) and composer for NYC's Hayden Planetarium, was inspired to set the suite to music! From echoes of Messiaen and Satie to contemporary classical and rock, Patchel’s songspiel is a wash of intricacy and color that conjures the sea, the sky—and the paper they are made of. Like Matisse’s cut paper works, Holman and Patchel’s collab is a vibrant, playful bite of astonishment. “Time for lunch, Henri/So eat your breakfast/Blue apple/Green coffee/Yellow fingers.” It was performed at HOWL Happening and the Gloucester Writers Center. Equal parts spoken word performer, professor, impresario, activist, proprietor of the Bowery Poetry Club, filmmaker and host of Language Matters (2015 Documentary of the Year, Berkeley Film Festival), to Bob Holman it's all just part of the job. He's a poet. From slam to hip-hop, from performance to spoken word, he's been a central figure in redefining poetry as it exists on, off, and beyond the page. 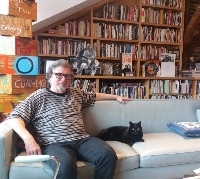 Author of 17 poetry collections, most recently The Cutouts (Matisse) from PeKa Boo Press and Sing This One Back to Me from Coffee House Press, Holman has been dubbed a member of the "Poetry Pantheon" by the New York Times Magazine. As a professor, he's taught at Columbia, NYU, Bard, and the New School. As an arts administrator, he's served as coordinator and curator at St. Mark’s Poetry Project, and was the original Slammaster and a director of the Nuyorican Poets Café. A scholar of oral traditions in West Africa and beyond, Holman co-founded the Endangered Language Alliance, where he currently serves as co-director. PBS NewsHour sits down with poet and host Bob Holman to discuss Language Matters and what's truly lost when a language disappears. Goutam (Gary) Datta and Subodh Sarkar, dear pals and Bengali poets, wrangled me an invitation to this year's Kolkata Book Fair, the largest in the world (if you count by foot traffic, not wheeling and dealing, which is the standard mode of capitalist book fair algorithms). One highlight just has to be my visit with Ravinder Das Baul; another was a trip to the Calcutta Chinatown hidden away by the railroad tracks. It looked like a giant opium den and the food was astonishing. My aesthetics felt right at home with the Bengali love for literacy and sung poetry personified by Rabindranath Tagore, the first Asian ever to win a Nobel Prize for Literature. Like everywhere else on the planet, Calcutta has changed dramatically in the 10 years since I was last there. Not as gentrified as the Bowery, but now with electricity everywhere and lights that illumine what used to be dark corners. Another highlight: the trip to Kalighat, the Hindu shrine for the Mother Goddess, a riot of colors and smells. A publishing company, Aihik (Earthly) Publishers, asked permission to translate the signature poem I read for Calcutta, HONK!, a poem I wrote when I was last there and traveled with Joy Harjo from the airport to the hotel amid a cacophony of rickshaws, diesel trucks, pedicabs, sacred cows, bicycles, and on and on, all honking their horns to acknowledge their joy in being alive. Joy herself could not resist and pulled out her saxophone to join the clamoring chorus. The 2015 PBS documentary Language Matters with Bob Holman is being screened on Qantas Airways flights. Click here to watch the film, and to find endangered language educational resources. Language Matters was also featured on "That Munanga Linguist" blog! Co-ordinated with International Mother Tongue Day, the launch of KHONSAY: Poem of Many Tongues is directed by Bob Holman and produced by Steve Zeitlin. With 50 languages in 15 minutes, the film was featured at the 2015 Margaret Mead Film Festival and won the Viewer's Choice Award at the Sadho Film Festival in New Delhi, India. An in-depth analysis of KHONSAY is available to tell you everything about the poets and languages. Bob Holman is creative consultant to Alonzo King's LINES Ballet company, whose production for spring 2017 is a work inspired by endangered languages, which will tour worldwide later in the year. Read more about it at The San Francisco Chronicle, and The Mercury News. With poet and painter Stefan Bondell, Bob Holman organized a marathon reading at Cooper Union's Great Hall to address these divisive times. Artists got to choose their style and content of address, and artists from across New York's Downtown Arts scene, as well as from across the country, took their turn to read at the podium where Abraham Lincoln spoke in 1860. Pictured below: Yoshiko Chuma, Ed Sanders, Anne Waldman, Papa Susso, Rev. Billy, Marc Ribot, Marilyn Nelson, Deray McKesson, Hettie Jones, Mohamed Hodeib, Cleo Wade, Tyrek Greene, Steven Taylor, John Giorno, Monica de la Torre, Amina Baraka. 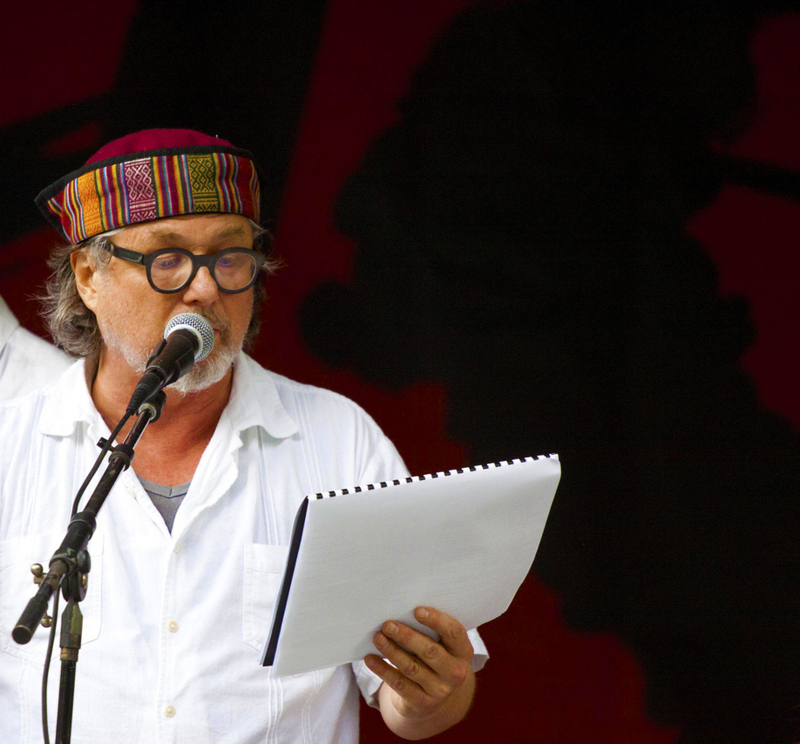 Bob Holman talks with host Baloo about language activism, the "United States of Poetry" and the role of poets vs. actors. Can the camera write the poem? How do poets mediate between media? 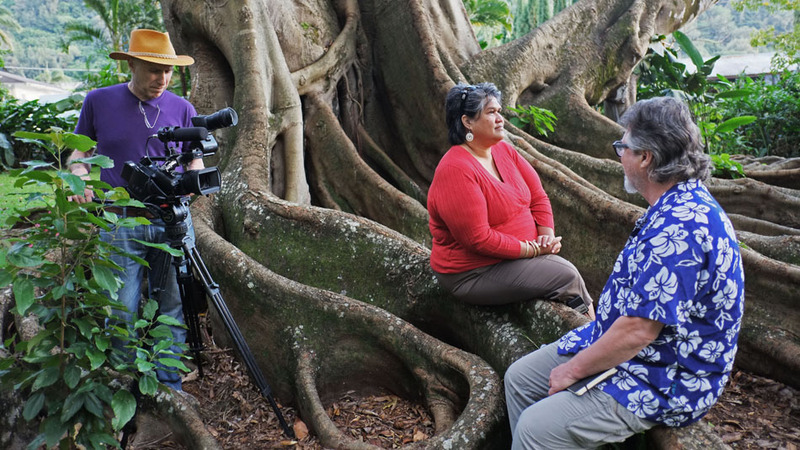 Find out about Bob's work with film, the oral tradition and endangered languages in this episode of 'Long Thoughts'. Ekphrasis, ekphrasis, ekphrasis. Art inspired by other art constantly inspires me and often results in cross-genre collaborations. I wrote a suite of poems, "Rue Surf", for Roy Fowler's explosive, oceanic frenzy paintings (Roy is a surfer! His paintings are often from the middle of a wave.) In fact, "New Wave" is the title of his show at Fort Gansevoort in Meat Packing, NYC, where the poems were performed with the Architect of Dance Geometry herself, Molissa Fenley. Mo and I have collaborated several times in the past, but this is the first time she ever choreographed moves for me. Click through the slideshow below to experience it for yourself. 'Let's Talk', with MArtín Espada! 'in with the out crowd' oN ITUNES, SPOTIFY AND APPLE MUSIC! 'The Awesome Whatever' on itunes, spotify and apple music! Ever wanted to hang out on the street with Pedro Pietri? on iTunes, Spotify, Apple Music, Amazon Music and many more- it’s The 'Awesome Whatever'! Live studio with my main motor scooter, multi-instrumentalist Vito Ricci. Don't forget to check out the secret track! The Bowery Poetry Club hosted a launch party for KHONSAY: Poem of Many Tongues. SOLSTICE 2016 also hosted a live stream of KHONSAY: Poem of Many Tongues, plus many other great international multimedia projects. SOLSTICE2016 will connected science, art, design, and technology in a global celebration across all 24 timezones. The multi-stream 24-hour event began during Happy Hour, 17:00 - 18:00, starting at the International Date Line and moving one hour at a time around the Earth. The stream featured art, music, and poetry from each timezone, sounds and videos of the earth from NOAA, indigenous and international poetry curated by Jerome Rothenberg and Bob Holman, music from 24 times curated by RIP and Adrian Hayman with Marc Nasdor and much more. SOLSTICE 2016 shows the myriad and invisibly powerful ways that design pulls the strings of our world through gestures, languages, sounds, music, tools, art and even whole societies. Viewers around the world were able to catch the 24-hour feed throughout the Solstice period at http://solstice2016.com from their smart phones, tablets or laptops, or attend one of the intimate live Solstice Pilot Launch parties to connect with an international community of Solstice enthusiasts. The SOLSTICE 2016 website features highlights of the program and an interactively searchable database with contributions from our participants. It is an assembly of unique world music and historical solstice materials for each time-zone as well as poetry, stories and event listings. 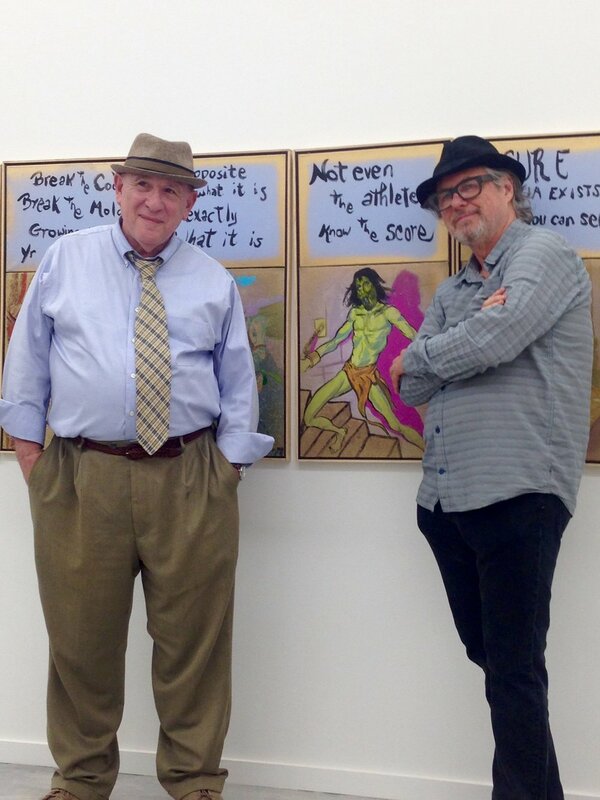 freight + volume gallery to exhibit holman-Rand collaboration "invisible city"
The extended, 50 piece poetry-painting collaboration between Bob Holman and Archie Rand will show at Freight + Volume Gallery, New York September 9 – October 8, 2017. Find out more here.